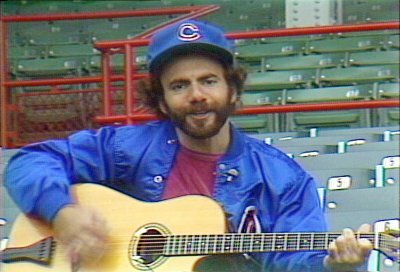 Steve Goodman at Wrigley Field, 1981. Photo courtesy Bob Sirott. The phenomenon of "Go, Cubs, Go"
The two tunes are forever linked, as the latter grew out of the former in Chicago grassroots fashion. After Goodman was banned from singing "Dying Cub Fan" at Wrigley because of its affectionate depiction of the team's futility, he was commissioned to write a more optimistic song. Thus was born "Go, Cubs, Go," just six months before Goodman's death. "Go, Cubs, Go," WGN-AM's song for the Cubs in 1984 and for several years afterward, became a true phenomenon starting in 2007. Since then, the catchy anthem has rocked Wrigley Field at the end of every home win, and all 40,000 fans present join in the singing instead of rushing out of the stadium. In 2007, this routine led Illinois Lt. Gov. Pat Quinn to declare Oct. 5, 2007, as Steve Goodman Day throughout the state -- just one day before a Cub loss dropped the team out of post-season competition. Throughout 2008, the 100th anniversary of when the team last won the World Series, the bellowing continued, both in and outside of Wrigley. The team echoed the strains, leading the majors in wins nearly all season long, only to drop three straight in the first playoff, falling short of the World Series once again. Because the Cubs tilted at their losing reputation in 2008, nearly every day the stellar musicianship of Steve Goodman gained new prominence. Articles in the Wall Street Journal and Washington Post and on the Major League Baseball and CBS Sports sites (to name just a few) saluted the enduring charm of Goodman's two Cubs songs. Through this coverage and the Wrigley experience, fans have developed new heartstrings for Goodman beyond his status as a peerless musician of his era. Goodman died at the young age of 36 of leukemia nearly 16 years after his first diagnosis, lending poignancy to hearing a ballpark full of fans singing "Go, Cubs, Go." The years have rolled on, and playoff status has eluded the Cubs until the Fall of 2016, when the Cubs won the National League Championship Series to advance to the 2016 World Series, and then won the ultimate prize, the World Series itself. Happily, many who are getting to know Goodman for the first time via his visceral love for baseball are discovering that he is the same guy who wrote the nearly mythical "City of New Orleans" and many other affecting romantic, hilarious and socially acerbic tunes. The Cub success in the World Series begs some serious questions. Will the team shed its "loveable loser" mystique and become just like every other team that seems to win it all every once in awhile? 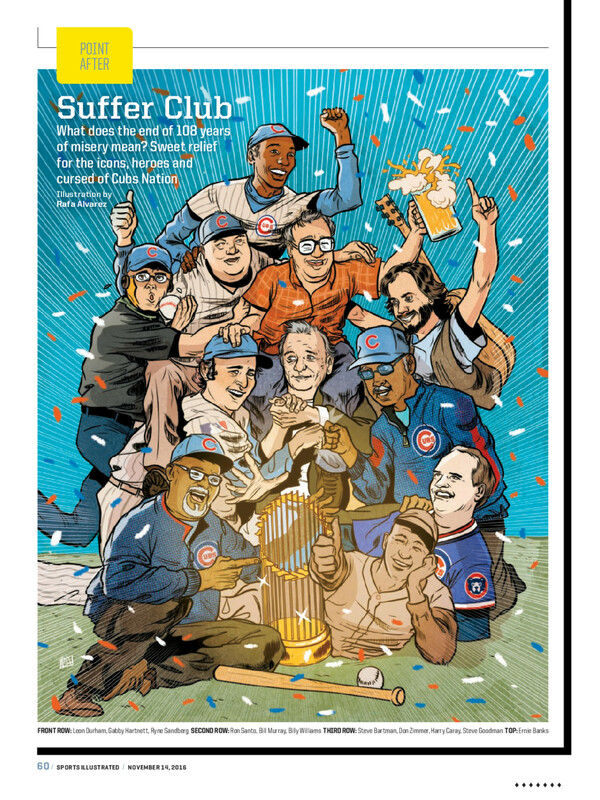 More pertinent to Steve Goodman, it is a milestone that the Cubs reached the World Series, which "Dying Cub Fan" pointed out sardonically hadn't happened since 1945. In a sense, "Go, Cubs, Go" has fulfilled its destiny, but some rewriting of "Dying Cub Fan" is in order. Or would anyone dare to rewrite what many consider the best baseball song ever? Through it all we can be sure that - from some unknown position - Steve Goodman was enjoying two bags of peanuts and a frosty malt, relishing a front-row seat to it all. Go, Steve, Go. Listen to Steve discussing the Cubs — at first sardonically, then affectionately — in a snippet from an audience tape made at his show on May 21, 1984, at Parody Hall in Kansas City, just seven months before he died. The symbiotic origin and impact of "Dying Cub Fan" and "Go, Cubs, Go" is a topic that is covered in great detail in "Steve Goodman: Facing the Music." © 2016 Sports Illustrated. Click on image for larger version.